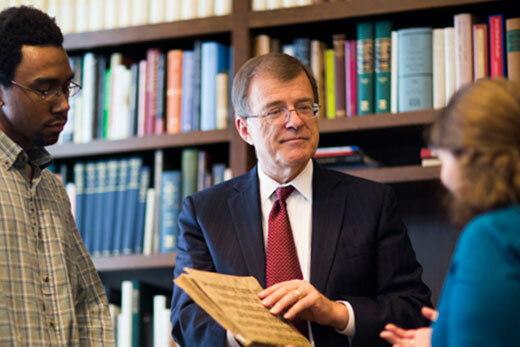 Retiring after more than two decades leading Emory's Pitts Theology Library, M. Patrick Graham likens his role to “hosting a banquet, where you introduce your guests to the greatest scholars and authors of all times and places." No food or beverages are allowed within the Special Collections reading room in Pitts Theology Library, but despite that restriction, you might find yourself a guest at a feast there. That’s how M. Patrick Graham, librarian and Margaret A. Pitts Professor of Theological Bibliography, sees the work of the library. “It’s like hosting a banquet, where you introduce your guests to the greatest scholars and authors of all times and places, provide a hospitable surrounding for their engagement, and then admire the great things that come from their time together,” says Graham, who will retire Aug. 31, after 29 years at Pitts. Graham was first a guest at the banquet when he was a student in Emory’s Graduate Division of Religion, where he earned a PhD in Old Testament in 1983. He returned to Pitts in 1988, serving two years as a cataloger of non-English language materials and four years as a reference librarian. While working at Pitts, he completed a master of library and information science from the University of Texas at Austin and further perfected the intricacies of academic librarianship under Channing Jeschke, the influential librarian who catapulted Pitts to stardom by tripling its holdings through the acquisition of the 220,000-volume Hartford Seminary collection. When Jeschke retired in 1994, Graham became director of the library — “the librarian,” in library parlance — and continued the work of growing Pitts’ collections. During Graham’s 29-year tenure, the library has expanded from 460,000 to 610,000 volumes, a 32.6 percent increase. Graham also took the lead on making Pitts’ resources available to those who can’t visit in person by creating the Digital Image Archive, an online catalogue of 60,000 downloadable images scanned from Pitts’ Special Collections. Just as Pitts was growing, so too was Candler. Graham spent a decade as chair or co-chair of the building committee that oversaw construction of a new 128,600-square-foot facility for Candler. Graham’s legacy also includes the remarkable staff at Pitts. Holladay notes that Dennis Norlin, former executive director of the American Theological Library Association, once called Pitts “the finishing school for theological librarians.” While Candler professors sent their students from their classrooms to Pitts, Pitts was Graham’s classroom, and his former students serve theological libraries across the country. Graham counts the cultivation of the extraordinary staff at Pitts as one of his greatest accomplishments. “The quality of service and professionalism among Pitts staff impresses visitors or newcomers who have come from other academic institutions,” he says. “They tell me how impressed they are with the competence of Pitts staff, their commitment to service, and their intellectual engagement with those who come to them. “Such excellence does not just happen but is the product of hard work, mutual encouragement, thinking together about our profession, and helping one another to go beyond what is the baseline for performance,” he says. Graham takes great pride that this level of excellence is now considered the norm for Pitts. As the fall semester gets underway, Graham will miss his favorite tradition — “the opportunity to welcome new students, call their attention to the wonderful resources that have been assembled for their benefit, and then offer them encouragement for one of the most important periods in their lives” — but he knows he has built a staff that can ably handle the task. After all, how can you pass up such a lavish banquet?